Often users want to run SELECT statement(s) against a relational database and send the results as email attachments. This guide demonstrates the steps to accomplish this task. 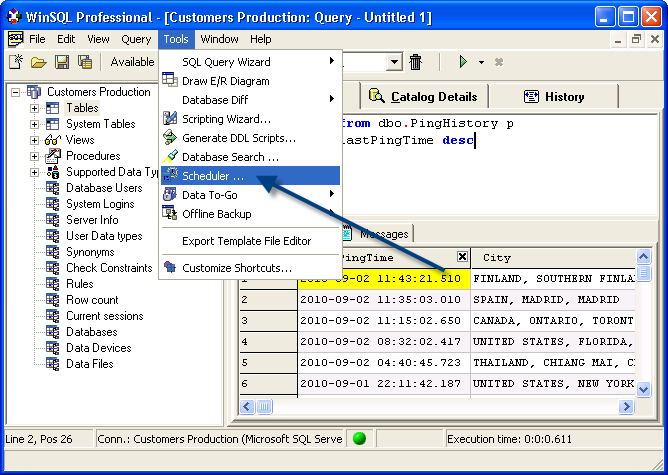 Run a SELECT query against any relational database. NOTE: MS Excel is capable of opening .CSV files as if it were a native MS Excel file. .CSV files are plain text files containing comma-delimited data. Since .CSV files are more portable and smaller in size than .XLS files we recommend using this method over saving the data to an MS Excel file. Next, click the Export results menu item. See below. 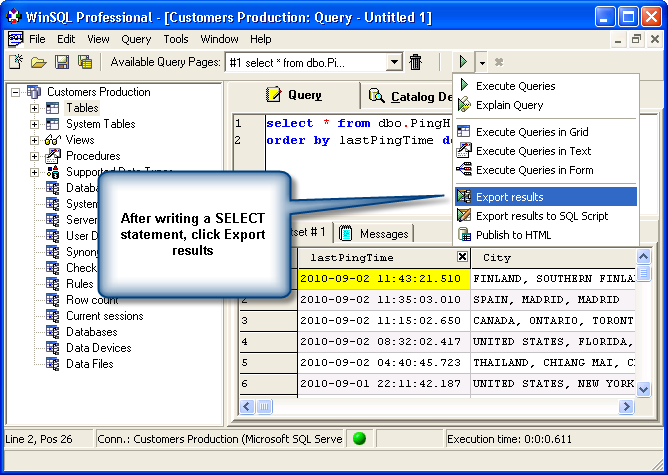 Select Export to an external text file on the next screen. See below. 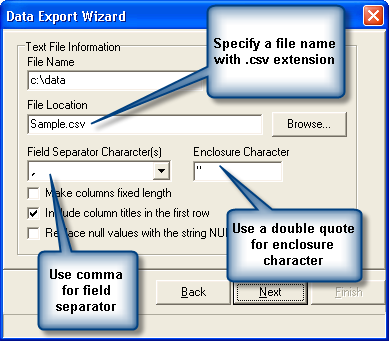 Specify options to export a comma delimited file, with a .csv for the file extension. See below. Next, save the template file to the disk. See below. 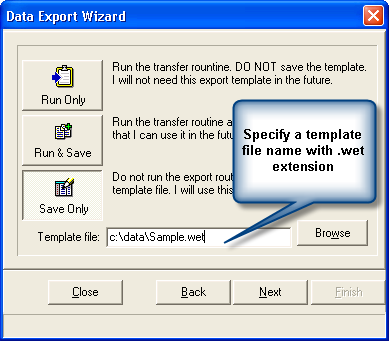 So far you have defined a template file for your export. Now you need to schedule a task that will run this template periodically. 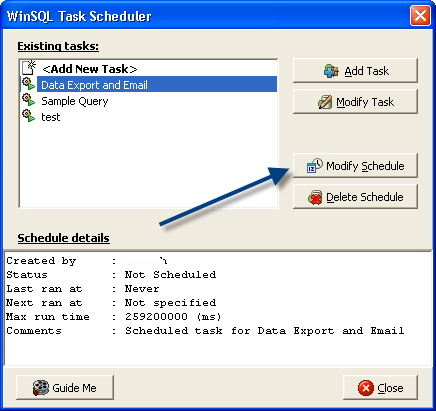 To do this click Scheduler under the Tools menu. This opens up the scheduler wizard in WinSQL. Click Add New Task to add a new scheduling task. 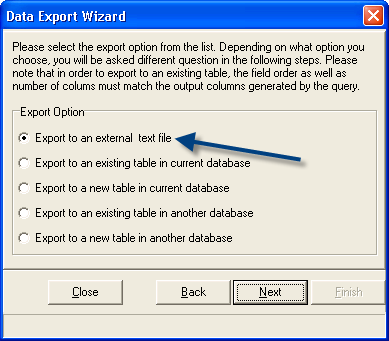 Task type: - Select Run Data Export Wizard for this option. Email status: - Select Send email regardless of results. Click the button to configure email settings. Once a task is created, click the Modify Schedule button to schedule the task. That is it. 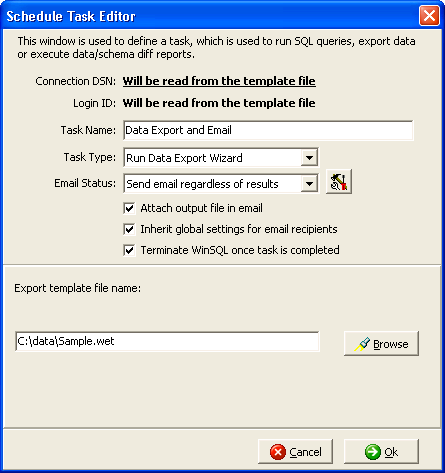 When the task runs, it will query the database, save data to a .CSV file that will be attached to the generated email. The recipient should be able to just double click the attached .CSV file to open data in MS Excel, provided his/her machine is configured to handle .CSV by MS Excel.